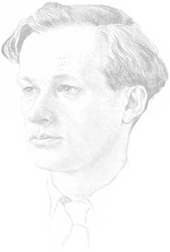 1908-1931: James Lees-Milne was born on 6 August 1908. Both his parents came from minor landed families which had made industrial fortunes in the 19th century; but the money was fast disappearing and JLM would receive little of it, and that late in life. His father, whom he feared, was a man of many gifts, but an irascible bully; his beautiful mother, whom he adored, instilled in him a love of nature, but was consumed by vanity. They neglected their children and led largely separate lives. JLM grew up a lonely, hypersensitive child, suffering from an inferiority complex. He spent much of his childhood wandering dreamily in the grounds of Wickhamford Manor, the atmospheric mediaeval property in Worcestershire which his parents had purchased around the time of his birth. At Lockers Park and Eton, he failed to shine at either work or games, and was regarded as dim and backward. 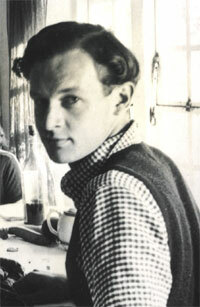 Though shy and withdrawn, he formed passionate friendships - notably with Tom Mitford and Desmond Parsons, both of whom would die young. He also conceived a passion for Tom's sister Diana (who would later marry JLM's relative, the fascist leader Sir Oswald Mosley). After Eton, his father made him take a secretarial course in London, as hilariously described in his autobiographical novel Another Self. But thanks to his mother's support he entered Magdalen College, Oxford at the age of twenty, reading history. Though failing to distinguish himself, he was taken up by such brilliant undergraduates as Basil Ava and Randolph Churchill; and he developed a love of poetry and architecture, encouraged by John Betjeman and Osbert Lancaster. He dreamed of a literary career, but remained immature. 1931-1936: With no qualifications, no money and little confidence in his abilities, JLM came down from Oxford in 1931 despairing about his future. But his soulful personality and romantic looks soon won him devoted patrons and patronesses. Foremost among these were two eminent men (both married homosexuals) who became father-figures to him and helped complete his education - the proconsul Lord Lloyd and the writer Harold Nicolson. Lloyd appointed JLM his private secretary and taught him to work hard; Nicolson - in whose London flat JLM went to live in 1934 - encouraged his interest in literature and introduced him to a set of brilliant young literary men including Raymond Mortimer and James Pope-Hennessy. Mother figures included Kathleen Kennet, the fascinating widow of Scott of the Antarctic, and the shipping heiress Mrs Bower Ismay. Meanwhile, JLM virtually broke off relations with his own parents for a time when he became a Roman Catholic in 1934 - a step bound up with his longing for authority and love of classical architecture. At the time of his conversion, he was attempting to write a biography of the Jesuit poet Hopkins, one of several abortive early literary works of which little trace survives. At this period JLM had many casual affairs with both sexes, and once made a girl cousin pregnant; the ensuing miscarriage lay heavily on his conscience and may have influenced his later enthusiasm for birth control. In the spring of 1935 he became engaged to Lady Anne Gathorne-Hardy, sister of Lord Cranbrook, a young woman with literary interests who lived in Suffolk and had four homosexual brothers. But their poverty made it difficult for them to marry, and JLM was depressed about his career, hating the job Lloyd had obtained for him as assistant to the head of Reuters, the bombastic Sir Roderick Jones. In a fit of despair, he broke off the engagement in January 1936, distressing her and shocking their friends.